The year I started photographing I ran upon this house out in Newberry Springs California that was slowing being swallowed by drifting sands. I later found it was the site of a brutal killing of a small boy by two dogs. I returned on my most recent trip out West to find even more of the house engulfed in sand, and the memorial to Cash Carson Slowly being erased as well. 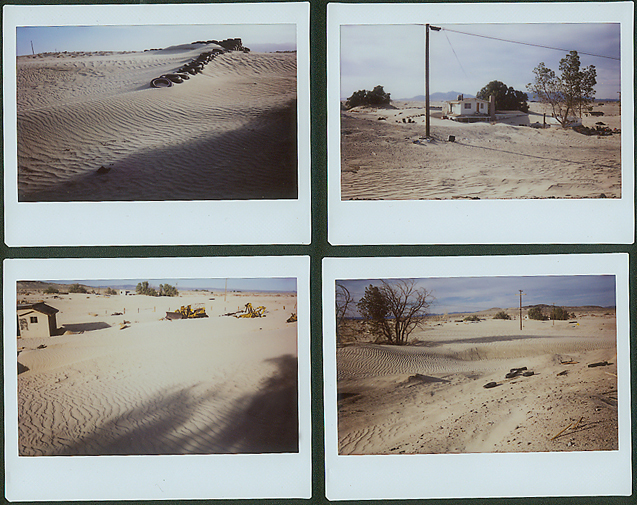 In 2001 the road led all the way to the house, but the dunes have covered the road with about four feet of sand. There is another house further south on the same road that was occupied at the time, with a back hoe and dozer to keep back the sands. Now that house is covered up to the second story, but a porch light is kept eerily on. I am going to try frinding those prints and negatives I made back in 2001 and 2002. Until I get a chance to develop the films I recently shot all I have are these Instaxes.